For research precisely designed to inform policy and practice, ensuring it has the desired impact is crucial. But tracking impact across many countries and diverse contexts can be difficult. Sonia Livingstone and Mariya Stoilova describe how the Global Kids Online project has built an impact toolkit which draws on recent empirical research with over 12,000 children. The ambition is to inform national and international policy and legislation around digital technologies, with a focus on safeguarding children’s rights. 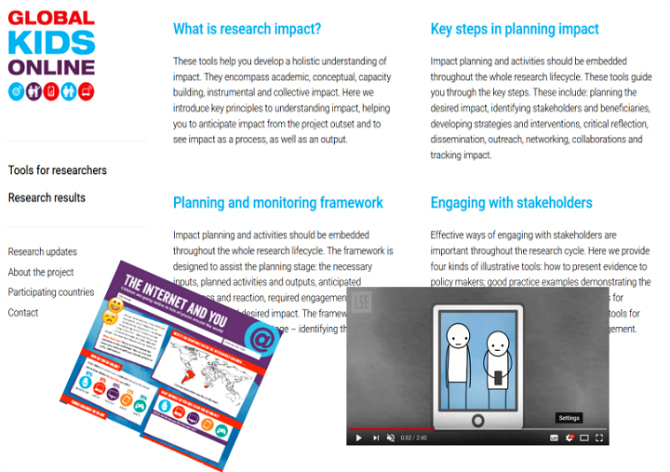 The impact toolkit contains accessible summaries of the approach, definitions, and key steps; an impact planning and monitoring framework, complete with templates and an exemplar framework; and tools for engaging key stakeholders, including guidelines on using evidence to inform policymaking, presenting findings to children, and communication strategies. Ensuring that research has impact is the name of the game these days, and when you’re engaged in research that’s precisely designed to inform policy and practice, you want to make sure that it has the impact desired. But when the research encompasses many countries, meeting the demands of diverse contexts is tricky. And when the fields of expertise to be impacted are also diverse, the challenge is compounded. Working collaboratively means drawing on the expertise of our country partners and learning from everyone’s success stories and difficulties; identifying joint priorities and advocacy activities that capitalise on the added value of centralised capacity-building and convening activities; and extending the wider value of the research and impact model to others working with or beyond the network. In reflecting on how we built the impact toolkit for Global Kids Online, we hope this also has wider value for other researchers facing related challenges. So, how did we tackle the task? To explain what kinds of changes can be expected, we turned to UNICEF’s Office of Research – Innocenti, which prioritises academic, conceptual, capacity-building, and instrumental impact; and to these we added collective impact as particularly important for multi-country research. Conceptual: influencing and reframing debate and dialogue among key stakeholders. Capacity-building: building competence at individual, organisational, or systemic levels for multiple purposes (teaching, advocacy, policy development, engaging in new practices, etc.). Instrumental: contribution to changes in behaviour, policies, programmes, and practice. Collective: brokering new partnerships, networks, or strategic alliances within and between countries aiming to develop joint commitments and common agendas and to foster longer-term social change. Academic: contributing to the long-term scientific evidence base. We figured researchers already know how to make an academic contribution, so the toolkit focuses on the other contributions. We are aware that long-term impact can be difficult to capture but we believe it is possible to capture “intermediate outcomes” or “pathways to impact” that signpost plausible longer-term impacts. Hence our focus is on identifying plausible pathways to research impact in the short and medium term, although we hope this will contribute to longer-term societal impacts, often beyond the lifetime of the programme. To combine the multi-stakeholder efforts of the network and address different country priorities, we drafted an impact planning and monitoring framework which was carefully tested by seven of our country partners and then adjusted based on their feedback and discussion. The framework provides a way to assess the uptake and impact of Global Kids Online work in the short to medium term. It aims to be a systematic but adaptable living tool that can be revised and adjusted throughout the research process according to country-defined research and impact priorities. Planning: this tool invites the research team to consider the efforts needed in relation to necessary inputs, planned activities and outputs, anticipated awareness and reaction, required engagement and participation, and desired impact. Monitoring: this tool helps in tracking and recording the actual impact achieved (intended and unintended), inviting the research team to identify the types of impact that have occurred, demonstrate how they have been verified, and reflect on lessons learned. This can be implemented by individual countries (or partners) and then combined to assess the overall impact of various country efforts, aided by being framed by a common strategic vision to facilitated opportunities for longer-term scaling-up and lesson-learning. Global Kids Online implements a partnership approach in which the benefits of central coordination of resources, expertise and tools are united with a distributed approach to evidence-gathering and impact, contributing to the development of evidence-based policy and practice – locally and globally. The network draws together international experts in child rights, child protection, internet and mobile technologies and governance, cross-national survey and ethnographic methods, applied and policy-relevant research, and area specialists from the global north and the global south. A multi-stakeholder, cross-national kick-off seminar established the overarching research and policy challenges to be addressed by the work of the network and identified key priorities for the collaboration. A follow-up two-day training workshop focusing particularly on knowledge exchange and impact strategies was organised once the project was under way. Getting started: an accessible summary of the approach, definitions, key steps, and links to all tools. Impact planning and monitoring framework: provides a way to plan, track, and evaluate impact throughout the project lifecycle. Includes a blank framework and a model framework filled in with examples. Tools for engaging key stakeholders: resources covering: using evidence to inform policymaking; examples of good practice from country partners; presenting findings to children; and communication tools. Global Kids Online is already attracting considerable interest from states, the private sector, and NGOs, and the research in our partner countries is already informing advocacy efforts and the development of national policy and practice. However, due to the scale of the project and the different stages of the research cycle of the partners, the task of efficiently tracking and monitoring the impact from our research is complex. Individual countries promote their findings and collaborate with local stakeholders but often have little time to track the ways in which their research is taken up, used, and reused in policy and practice settings, and struggle to link research processes or outputs to wider changes. To optimise the added value of cross-national comparisons and seek evidence for the collective impact of the project, as well as to identify broader lessons (both positive and negative) to enable refinement of our approach as it is rolled out in additional countries, the network steering group is now commissioning an independent assessment of the country and collective impact of Global Kids Online’s work. For more information on Global Kids Online, and to access the research toolkit and other resources, please visit http://globalkidsonline.net/. There has been an fairly fast boom in domestic get entry to to the net in the united kingdom, across Europe and an increasing number of round the world as kids in high, center and now low-income countries have dramatically elevated net access, frequently via cell phones,” explains Professor Livingstone. “This has converted their access to records and studying equipment and to worldwide varieties of communique and participation. It has additionally brought new threats to non-public safety wherein youngsters may be particularly at threat.